This is the big one, 007. 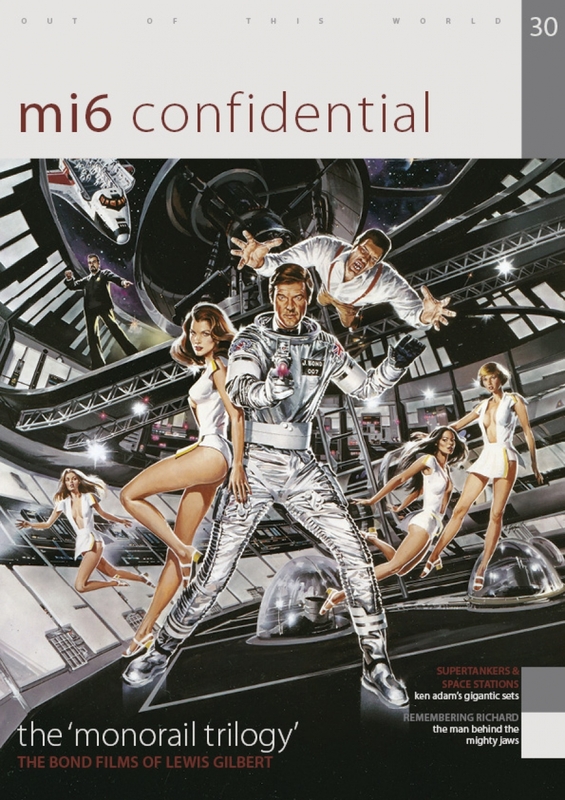 The new issue of the glossy James Bond fan magazine MI6 Confidential, which has just gone on sale, is devoted to what has been termed the ‘monorail trilogy’, and offers some extensive coverage of the three Bond movies directed by Lewis Gilbert. The claim that each new Bond movie was ‘bigger’ and better than ever was certainly a notable theme in the marketing campaigns used for You Only Live Twice (1967), The Spy Who Loved Me (1977) and Moonraker (1979), and with very good reason. Each of these three 007 adventures arguably projected a grandeur and scale never seen before in spy movies. The exciting new issue includes a rare still of Donald Pleasence as Blofeld sitting with Lewis Gilbert in the You Only Live Twice volcano monorail ‘pod’, together with brand new interviews with the 3-times Bond director and his acclaimed production designer, Sir Ken Adam. The magazine also celebrates the life and work of the late Richard ‘Jaws’ Kiel (1939-2014). The Monorail Trilogy: The Bond films of Lewis Gilbert. You Only Live Twice: From volcano lairs to villainous vixens. The Spy Who Loved Me: Nobody does it better than Cubby Broccoli. Moonraker: Taking James Bond further than ever before. Supertankers and Space Stations: Sir Ken Adam reflects on designing Bond. Remembering Richard: A tribute to the late, great Jaws actor. Ian and Roald: Fleming’s connection with the author/screenwriter Roald Dahl (who penned the screenplay for You Only Live Twice). The Bond Connection: The spy-fi posters of Robert McGinnis. Click here to buy MI6 Confidential, no. 30 (2015) – on sale now. It is something all dedicated Bond fans should really get their teeth into. The author Roald Dahl (1916-1990), who was chosen by 007 producer Cubby Broccoli to create a new movie storyline out of elements of Ian Fleming’s 1964 novel You Only Live Twice, had known the James Bond author very well. During World War Two, both Dahl and Fleming had carried out secret propaganda work for the famous spymaster Sir William Stephenson (who was known as ‘Intrepid’). Interestingly, recent Bond continuation author William Boyd has also drawn upon some of this intriguing wartime background for his own espionage fiction.